Makers Barn01263 715779work01603 870304fax Self-cateringSet within a quiet north Norfolk coastal village Makers Barn offers the perfect place for a truly relaxing break. Built using traditional brick and flint, this barn is spacious, modern and interesting, and benefits two separate bedrooms suites so would suit two families wishing to holiday together. With parking for four cars and a fully enclosed rear garden this is the perfect spot for a holiday by the sea. Venture into neighbouring Overstrand for a super day at the beach, with a cliff top cafe within walking distance you wont have far to go for your ice creams or a spot of lunch. For an evening meal there is a hotel and a popular pub both serving locally sourced food and drink. For a more traditional visit to the seaside make your way into Cromer, a popular Victorian town with a wealth of local history, shops and amenties. Visit the RNLI Lifeboat Museum on the promenade, which houses a full size disused lifeboat, and learn about life as a crew member. Cromer pier, which has been used in many television and film productions, is home to one of only five UK seaside pier’s with a full working, flourishing theatre and home to the only end of pier show of it’s kind in the World! For those who are not a fan of having sand between their toes there is plenty to keep you amused inland - visit the Norfolk Broads National Park, a truly stunning and tranquil vast area of wide expanses of water (Broads) and meandering rivers. There are plenty of panoramic spots from which you can birdwatch, fish, and simply take in the views, or would highly recommend exploring by boat, which you can hire for a a few hours or a day from one of the many boat yard operators in the area. Take a train into Norwich for a super day out. Visit one of the many museums including Norwich Castle Museum where you can learn about Norfolk, including life in the roman times, the wildlife of Norfolk and there is plenty of interactive learning. There really is so much to see and do, you will want to come back again and again. • Notes: This is a non smoking property. Special Offer: 30% discount for parties of 4 and under using two bedrooms on selected low season weeks. 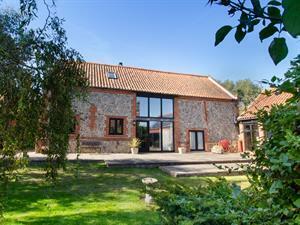 Set within a quiet north Norfolk coastal village Makers Barn offers the perfect place for a truly relaxing break. Built using traditional brick and flint, this barn is spacious, modern and interesting, and benefits two separate bedrooms suites so would suit two families wishing to holiday together. With parking for four cars and a fully enclosed rear garden this is the perfect spot for a holiday by the sea. Venture into neighbouring Overstrand for a super day at the beach, with a cliff top cafe within walking distance you wont have far to go for your ice creams or a spot of lunch. For an evening meal there is a hotel and a popular pub both serving locally sourced food and drink. For a more traditional visit to the seaside make your way into Cromer, a popular Victorian town with a wealth of local history, shops and amenties. Visit the RNLI Lifeboat Museum on the promenade, which houses a full size disused lifeboat, and learn about life as a crew member. Cromer pier, which has been used in many television and film productions, is home to one of only five UK seaside pier’s with a full working, flourishing theatre and home to the only end of pier show of it’s kind in the World! For those who are not a fan of having sand between their toes there is plenty to keep you amused inland - visit the Norfolk Broads National Park, a truly stunning and tranquil vast area of wide expanses of water (Broads) and meandering rivers. There are plenty of panoramic spots from which you can birdwatch, fish, and simply take in the views, or would highly recommend exploring by boat, which you can hire for a a few hours or a day from one of the many boat yard operators in the area. Take a train into Norwich for a super day out. Visit one of the many museums including Norwich Castle Museum where you can learn about Norfolk, including life in the roman times, the wildlife of Norfolk and there is plenty of interactive learning. There really is so much to see and do, you will want to come back again and again.